Habit: Annual, perennial herb, unarmed. Leaf: generally odd-1-pinnate; stipules gland-like, reduced to bumps, or inconspicuous; leaflets 3--9, lower 2 in stipular position or not, others +- palmately arranged. Inflorescence: umbel or 1--3-flowered, axillary, peduncled, bract 1--3-parted. Flower: corolla generally yellow, in age darkening; 9 filaments fused, 1 free. Fruit: dehiscent, exserted from calyx, linear to narrowly oblong, +- beaked. Seed: few to several. Species In Genus: +- 125 species: Europe, Africa, to eastern Asia, Australia, New Caledonia; cultivated as forage, ground cover, ornamental. Etymology: (Greek: derivation unclear) Note: Other taxa in TJM (1993) moved to Acmispon and Hosackia. Habit: Perennial herb, glabrous or strigose. Stem: decumbent or ascending to erect, generally solid. Leaf: stipules gland-like; leaflets 5, 4--22 mm, 2--11 mm wide, ovate to obovate, tip obtuse, often abruptly soft-pointed or acuminate. Inflorescence: (1)3--7(10)-flowered; peduncle 1.5--12 cm. Flower: calyx 5--7.5 mm, lobes +- = tube, not outcurved in bud; corolla 10--14(16) mm, bright yellow. Fruit: 1.5--3(4) cm, narrowly oblong, glabrous. Seed: few to several. Chromosomes: 2n=24. 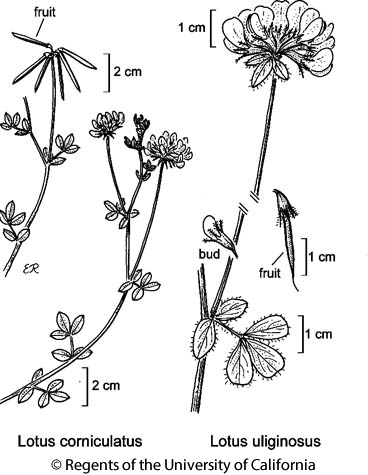 Citation for this treatment: Luc Brouillet 2012, Lotus corniculatus, in Jepson Flora Project (eds.) Jepson eFlora, http://ucjeps.berkeley.edu/eflora/eflora_display.php?tid=31561, accessed on April 22, 2019.